A good campus life is almost as important for a student as academic excellence and thanks to things they see and read on the internet, the expectations now are higher than ever. No one wants to be the 'dull jack' who is all about work and this is what makes their experiences outside the classes so important. A good campus life is the inclusion of everything from fests to competitions and other events. Colleges nowadays have to put a lot of emphasis on making college an enriching experience for students in every sense so that when they enter the real world, they are not someone whose knowledge is not limited to technical skills but can, in fact handle various kinds of situations that might be thrown in. While we are talking about life in college, it would be negligent to not mention GLA University, which has great facilities for its student for their overall growth. Situated in Mathura, the spacious GLA campus is spread across 110 acres of land and is home to more than 12,000 students enrolled in a variety of professional courses. The infrastructure leaves nothing to be desired for as well designed and maintained buildings, contemporary laboratories, spacious residential complexes and recreational facilities give students an edge over their counterparts who study in other universities in the same region. The university is divided into ten academic blocks which are beautiful and very well equipped. The university has a central library and separate libraries for each department. With more than a hundred thousand books, journals, magazines, newspapers, encyclopedia and thousands of CDs, these libraries are equipped with everything to answer all our student's queries. As a member of DELNET, students at GLA have access to 83,69,299 bibliographic records, 33,541 periodicals along with a huge range of CD ROMs and e-books. The GLA Community is globally connected through a 1GBPS gold line of NMEICT and Airtel computing facilities provided on more than 1200 computers, organized systematically in 9 computer centres. For safety and well being of students, transportation and healthcare facilities, including ambulance for emergencies are provided by the university. The GLA campus is technologically advanced and conducts online lectures by IIT professors on LAN through NPTEL. It also provides classle classes which is a digital learning and teaching portal. The institute has great industrial tie-ups and is part of India’s first ‘Mission 10Xs Technology Learning Centre’ by WIPRO, Campus Connect Program’ by Infosys, 'Centre of Excellence’ by IBM. However good the infrastructure is, there's no denying the fact that an institution is what it is because of its students and it is important for them to interact with people from different areas and environments to be able to develop into a responsible citizen. GLA university welcomes students from every nook and corner of the country and the diverse population in terms of ethnicity, religious and economic backgrounds is what makes education here an elevating experience. At GLA, students are given extra-curriculars, co-curricular and athletic opportunities in addition to academics, so that they are active around and beyond the campus. Apart from cultural and technical festivals, a great deal of importance is attached to sports events and the university boasts off a department dedicated to it. 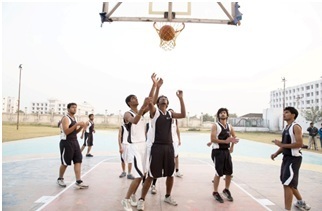 The university has facilities for both indoors and outdoor games like football, cricket, hockey, badminton, basket ball, volley ball, athletics, carom, chess and table tennis. In addition to that, there is a gymnasium in both girls and boys hostel for their physical well-being. • Volleyball, Football, Badminton, Basketball, Chess tournaments every year. Apart from the sports activities, there are events organized by clubs of specific departments at GLA. For example, Institute of Pharmaceutical Research celebrated world pharmacists day & national pharmacy week which consisted of academic and entertainment programs. Other important societies are: E-Soc for Institute of Applied Sciences & Humanities, HR club, Marketing Club, Finance club and IB Club for Institute of Business Management, MechaSonic for University Polytechnic, ABACUS, AASHAYEIN among others for Department of Computer Engineering & Applications etc. GLA University also provides round-the-clock medical facilities which are provided by the healthcare unit: Aarogyam. The unit ensures physical well-being of students, faculty and support staff. University aims to offer 24x7 prompt and effective medical, surgical and psychosocial support to all workers and residents within the GLA Campus. It also creates awareness about the importance of exercise and yoga, avoiding junk food and eating fruits and green vegetables along with a high fibre diet, minimizing use of mobile phones and limiting use of head-phones to listen to music etc. Apart from that, all basic medicines that may be required for managing commonly encountered conditions are available and dispensed as daily doses. Meeting change makers can be a very constructive experience for a anyone and GLA university makes sure that its students do not miss out on that. Famous personalities like Hema Malini and Baba Ramdev have graced the institution with their presence in the past and interacted with students to congratulate them on the efforts they put in towards making the India a better nation. GLA university was founded with the mission of making Mathura a recognized destination for knowledge seekers from different walks of life and with its constant efforts towards giving quality education and exposure to its student, the varsity is only going closer to that vision.